With Kara knocked into a coma following her battle with Reign, Mon-El summons his ally, Braniac-5, to restore Kara's mind while he, Saturn Girl and the DEO confront Reign. The cliff-hanger at the end of the last episode, in which it was implied that Samantha was about to turn on Ruby, turns out to have an artificial fake-out. Why didn't J'onn use any of the weapons from The Sundown Protocol back during the battles with the rogue Kryptonians in Season One or the Daxamites in Season 2? Even without Kryptonite (which they let Superman dispose of in Season 2 and which wouldn't work on Daxamites anyway), sound bombs and red sun light grenades would have been incredibly helpful in both fights. Based on the timeline of the episode (it's clearly dark when J'onn goes to Kara's apartment), either National City has banks that are open 24 hours a day, complete with open lobbies and teller service, or The DEO counted on Reign not noticing that a fully-staffed bank was being robbed at night when setting their trap. Wouldn't it be possible for The Legionaries to make copies of their DNA information and lock it in a time capsule in case something should happen to one of them, just in case? Winn points out, when Alex suggests injecting Reign with Kryptonite right in the jugular vein, that they don't have anyone strong enough to drive in the needle. A more worrying point is that they don't have any material capable of piercing a Kryptonian's skin, regardless of the force behind it. Winn also seems to forget that Mon-El had super-strength on par with Supergirl, despite Mon-El being there in the room. How the heck did Thomas Coville escape from prison? For that matter, how did he make the journey to The Fortress of Sanctuary? There is something oddly amusing about the way in which David Harewood says "Oh no, not again." upon finding out he has to play Kara in order to protect her secret identity. 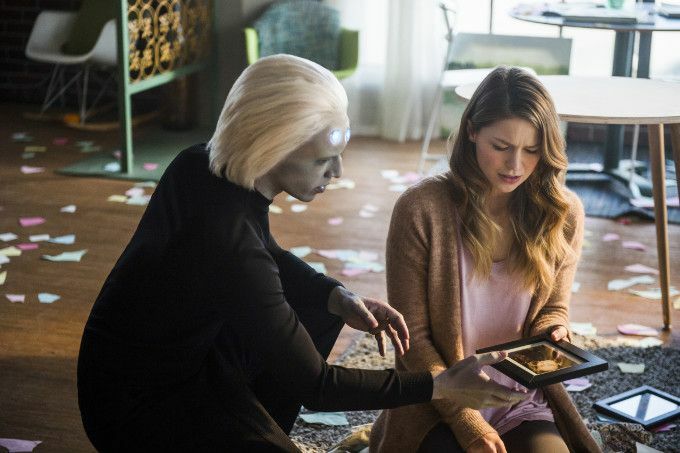 That is not quite as amusing, however, as Melissa Benoist playing J'onn pretending to be Kara. The non-verbal acting as Melissa Benoist plays Kara discovering her glasses and the key out of her apartment is a magical thing to behold. Good special effects work on having the walls around Kara's front door "bounce" as she tries to escape her mind prison. The episode's title comes from the classic comic series and team The Legion of Super-Heroes. In the original comics, the teenagers who built The Legion of Super-Heroes were inspired by Superman's tenure as Superboy. They first appeared in Adventure Comics #247 (April 1958), when Cosmic Boy, Lightning Lad and Saturn Girl traveled back in time to test Superboy's worthiness to join The Legion. Their tests, which Superboy failed, turned out to be a hazing ritual of sorts and The Legion had already voted to allow Superboy membership on their team. Brainiac-5 first appeared in Action Comics #276 (May 1961) and was created by Jerry Siegel and Jim Mooney. Born Querl Dox on the planet Colu in the 31st Century, he was a hero who joined The Legion of Super-Heroes and sought to atone for the sins of his ancestor - the villain known as Brainiac who fought Superman in the 21st century. A brilliant inventor, Brainiac-5 created The Legion of Super-Heroes flight rings, a force-field belt and the anti-lead serum that allowed Mon-El to survive outside The Phantom Zone. We later see Mon-El, Saturn Girl and Brainiac-5 don Legion Flight Rings as they go to confront Reign. Brainiac-5 is a 12th Level Intelligence. By way of a comparison, 21st Century Earth is considered to have an average Intelligence of the 6th Level and the average Coluan of his time has an intelligence of the 8th Level. Brainiac-5 and Supergirl were romantic linked in some incarnations of The Legion of Super-Heroes. In the DC Animated Universe, Supergirl elected to stay in the 31st Century after an adventure sent her, Green Lantern and Green Arrow into the future. This was partly due to the historical record showing that only two Justice League members returned to their own time after coming forward to help The Legion and partly due to her newfound love with Brainiac-5. Brainiac-5 makes reference to a third-degree extinction event in 2455 that brought about the collapse of all human civilization and the loss of most historical records, culture, art and music. This could be a nod to The Great Disaster - the unspecified future event from the Kamandi - The Last Boy On Earth comics created by Jack Kirby - that destroyed all civilization. The setting of Kamandi was an unspecified future where humanity had descended to savagery and evolved animals ruled the Earth. Mon-El speaks of a planet called Winath from the 31st Century, saying it is a farming planet that went dark. In the original Legion comics, Winath was an agrarian world described as the bread-basket of the United Planets. Mon-El pronounces Winath as "Win-ath". The question of Winath's pronunciation has long been a matter of debate among Legion fans. As a nod to the three most popular theories, writer Geoff Johns revealed in Final Cirsis: Legion of Three Worlds that all three versions of the Legion in DC Comics Continuity had a different way of pronouncing Winath. In the Reboot universe, it is pronounced "Win-Athe", in the Threeboot universe it is pronounced "Win-Ath", and in the post-Infinite Crisis universe it's pronounced "Wine-Ath". Mon-El speaks of a friend named Ayla who is from Winath. This is a reference to the Legion member Ayla Ranzz - a.k.a. Lightning Lass/Light Lass/Spark. Her twin brother is Garth Ranzz a.ka. Lighting Lad. For some reason, most of the children born on Winath are fraternal twins - one boy and one girl. Saturn Girl speaks of Winath being decimated by beings called The Blight who consume everything in their path. This is a nod to The Blight - a techno-organic race whose bodies were composed of rotting flesh and technology. Basically cyborg-zombies, The Legion of Super-Heroes fought them in the 1999-2000 storyline Legion of the Damned. The Sherlock Holmes line to which Kara refers comes from A Study In Scarlet - the first Sherlock Holmes story by Sir Arthur Conan Doyle - "I consider that a man's brain originally is like a little empty attic, and you have to stock it with such furniture as you choose." Kara makes reference to having a pet cat as a teenager named Streaky. In the original Supergirl comics in Action Comics, Kara Danvers also had a pet cat named Streaky, named for the white lighting-bolt shaped streak in his orange fur. Streaky first appeared in Action Comics #261 (February 1960) and acquired superpowers after being exposed to a piece of X-Kryptonite, which gave superpowers to animals. Streaky had super-strength, super-speed, super-vision flight and human-level or better intelligence. Since that time, various versions of Supergirl have owned a pet cat named Streaky, but only the original version of Streaky had super-powers in the original DC Comics universe. However, super-powered versions of Streaky have shown up in other comics and cartoons, most notably the Krypto The Super-Dog show, Tiny Titans and the DC Super-Pets books. The DCTVU version of Streaky has black fur, instead of orange fur. At one point Brainiac mentions an Aloian attack formation. The Aloai are an alien race who appeared in Action Comics #517 (March 1981). They have blue skin and rigged foreheads and appeared in a Superman story where they were at war with another race of aliens, The Margoi, fighting over a device which they called "The Grayl". Braniac-5 uses the word "sprock" as a curse at one point. In the original Legion comics, "sprock" is also used as a curse word in the 31st century. Saturn Girl is depicted as having telekinetic abilities, throwing heavy weights at Reign as a distraction as Mon-El attempts to move in close with a Kryptonite knife. She also creates a telekinetic force-field that protects Mon-El from Reign's ice-breath. While primarily depicted as a telepath in the comics, some versions of Saturn Girl in the comics and cartoons have been shown to have telekinetic abilities as well. Brainiac-5 notes that he is a 12th Level Intelligence. 31st century technology allows doctors to communicate telepathically with coma patients. In this case, Brainac-5's crown connects to his internal AI core, translating Kara's brainwaves into English while sending his thoughts to her as electronic signals her brain can understand. Brainiac-5 makes reference to a third-level extinction event. The DEO has access to sound bombs and red-sun grenades capable of hurting a Kryptonian. Brainiac-5 claims to have envisioned 4,237,642 versions of his first meeting with Supergirl. None of them involved her describing it as torture. Brain damage in a psychic simulacra can manifest as various forms of decay - mildew or mold. Rats typically indicate neurological issues. Reign: This man was a thief, condemned by his own actions. You've allowed sin to take root and fester like a weed. And worst of all, you have looked away. Apathy is the greatest sin of all. From now on it will be punished in kind. There will be no mercy. There will only be justice. (pauses) I am here to help. Winn: Hey! Boss! So, uh... uh... James just called. J'onn: I fail to see the relevance. J'onn: Oh no. Not again. J'onn: (as Kara) You have no idea how much I am not feeling like myself. J'onn: No Supergirl. No cavalry. Reign is strong, but she doesn't know what we're capable of. Let's show her. J'onn: I just had a conversation about James Olsen's extraordinary kissing ability. This will be a Sunday picnic. Brainy: Why are you cleaning? None of this real. Kara: I don't know. I guess I just like putting things back in order. And... my brain, originally, is like an empty little attic and you must stock it with such furniture as you choose. That's Sherlock Holmes. Kara: This is the furniture I chose. Brainy: But ah, yes. Go on. Kara: So there must be something in here that my subconscious wants me to see! Brainy: Mmm... that's.... that's actually not a bad idea. Why didn't I think of that? Alex: (to a comatose Kara) I'm so sorry. I did this. I mean, I'm the one that pushed you into that fight. I told you that Kara Danvers was my favorite person. And then I told you to forget who you were. And now I'm... I don't know if we can do this without you. Brainy: You had a pet? Kara: Yeah. But if this is my subconscious trying to tell myself something, I don't get it. Brainy: Could be a random neuron firing. What's it's name? Kara: Streaky. I, uh- I found him on our street. Right after I came to Earth, actually. He was a stray too. Brainy: You felt an emotional kinship. Kara: Yeah. (chuckles) Yeah. We were friends. Kara: I used to go out every night and feed him. (Kara kneels down and begins to pet Streaky) I didn't want to touch him. I was so strong I could have hurt him. So I practiced being gentle. And then one day I pet him. (Kara picks Streaky up and sits down, stroking his back.) And he purred. And everything was okay. I felt like an alien on Earth for so long and... and he made me feel like a human. Brainy: Oh! Sprock! Did I say that out loud?! The Legion's spaceship blaring "Living On A Prayer" by Bon Jovi as Reign is contemplating killing or sparing Thomas Coville as he prays to Rao. The events of this episode start two days after the events of 309. Kara's psyche resembles her loft apartment. Curiously, for all the emphasis she claims to place on being Kryptonian over human, Kara's inner-self dresses in Earth clothing like Kara Danvers but without glasses. This turns out to be a bit of foreshadowing, as Kara must clean her glasses and put them on before she finds the key that unlocks the door out of her apartment, allowing her to wake up. Brainiac-5 notes that Kara is in remarkable mental health for someone in a coma. Mon-El says that The Legion can't get directly involved in the battle with Reign because their deaths could doom the 31st Century. Mon-El also speaks of The Legion having a mission of which he cannot speak of the particulars and that getting involved with the fight against Reign might jeopardize their mission. Mon-El does say that Supergirl will survive the war with Reign and that Reign will eventually "leave" but he does not know the particulars beyond that. While the historical record shows what events may have happened, there is no way of knowing precisely how they came to happen. Braniac-5 speaks of a third-level extinction event in 2455 that caused catastrophic destruction. While humanity came together as a result, most historical records, music, art and culture were destroyed in the cataclysm. Apparently most of what the people of the 31st century know of the 21st century and what came before came from Mon-El's knowledge. It was he who told them about Aristotle, Shakespeare and Bon Jovi. The Sundown Protocol is a highly-classified contingency plan the DEO crafted if it ever had to take-down Superman or another rogue Kryptonian. It allowed for the use of red-sun grenades, Kryptonite darts and sound bombs. Winn refers to Superman destroying all of the DEO's Kryptonite in 202. J'onn makes reference to the Kryptonite from "Coville's probe" from 304 and confirms the DEO still has it. Mon-El eventually reveals the circumstances of how he and his team came back to the past and why it is important they remain safe to preserve the future to Alex. In the 31st Century, there is a race of cyborg-zombies called The Blight, who destroyed the farming world of Winath. Braniac-5 found a way to defeat The Blight, but before they could use it, they were forced to time-travel to escape from The Blight. The secret of defeating The Blight is encoded into the DNA of all of the time-lost Legionaries, meaning they must all survive and make it to the future in order to stop The Blight in the 31st Century. J'onn refers to the events of 113 and how he once had to impersonate Kara to protect her secret identity. Reign appears to be resistant to the effects of Kryptonite, for some reason. Alex's lower leg is broken during the fight with Reign. Kara is enough of a fan of the original Sherlock Holmes' stories to know a specific quote from A Study In Scarlet. Kara had a pet cat named Streaky when she was a teenager, who taught her how to control her strength shortly after coming to Earth. Reign attacks Albatross Bay - the Alcatraz-style high-security prison in National City. Brainiac-5 made himself look taller when he was inside Kara's mind. Brainiac-5 signed Alex's cast in binary. Reign is informed that there are others like her on Earth - a fact that the AI in her Fortress of Sanctuary kept her ignorant of until she had proven herself worthy. Thomas Coville joins with Reign and tells her that he can help her find the others like her. The Legion speak of their battle with The Blight in the 31st century and how it devastated the world of Winath. Proof that there are few things worse than a Supergirl episode that is light on Supergirl. It's telling that the best moments of the episode are the ones that involved Melissa Benoist either playing against type as J'onn as Kara, her interactions with Brainiac-5 or her monologue on learning to be human. That being said, this episode isn't all that bad and Brainiac 5 proves a welcome addition to the cast. It's just irritating that the audience likely figured out the lesson Kara was meant to learn several episodes ago and it's blindingly obvious that Kara will defeat Reign by encouraging Samantha to remember her humanity and her daughter at some point before the end of the season. Taken for what it is, this episode is amusing enough if you ignore that none of the Legion members besides Brainiac-5 really do anything.